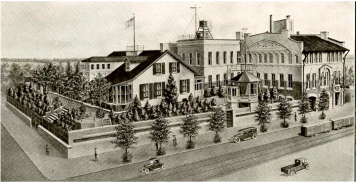 The Julien P Friez Company was founded in 1876 in Baltimore, Maryland as a manufacturer of weather instruments. They operated the Belfort Observatory in Baltimore. They became Julien P Friez & Sons in 1913, and Julien died in 1916. In 1929 the company was acquired by the Consolidated Instrument Company. A year later the company was acquired by Bendix Corporation. The Friez company operated relatively independently at first but they began calling themselves the Friez Instrument Division of Bendix sometime around 1943. They continued in operation until about 1966. Bendix was acquired by Allied Corporation (later called AlliedSignal) in 1983, which later bought Honeywell and adopted the Honeywell name. ​One of Julien Friez's sons founded an instrument company in the Belfort Observatory workshop of Julien P Friez & Sons in the late 1940s, which was renamed the Belfort Instrument Company in 1949. Belfort Instrument continues to develop and sell meteorological instruments today, still in Baltimore though no longer at the Belfort Observatory location. A color version of the same 1931 catalog may be ​downloaded here via Dropbox. It is too large (460 MB) for direct download from my web service provider because it is in color. The source for charts for Friez, Bendix, and Belfort instruments is Belfort Instrument.